Rita looked stunning walking down Park Avenue this evening with her friends. Her feminine skirt and blazer look great with her booties, oversize hat, and golden accessories. All the way from Roma! When we told this couple how great they look together, the gentleman replied, “Well, we’ve only been married for 58 years!”. He also told us that “it’s all a matter of choosing your grandparents carefully”. They are an adorable pair, and wear those 58 years very well. Click Here for more information about “the lady in red” originally posted on September 4th. 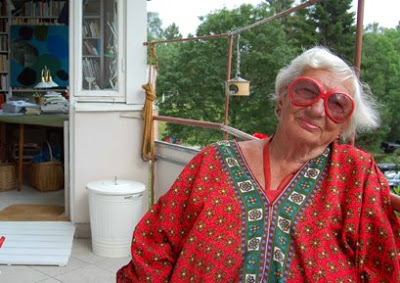 Hanneli was kind enough to share some additional information about writer, Mia Berner. Check below to watch a video of this amazing woman, unfortunately I couldn’t find a video in English, but it will give you a good look into her great style. What first drew me to this lady were her over sized green sunglasses and chic pinstriped pantsuit. 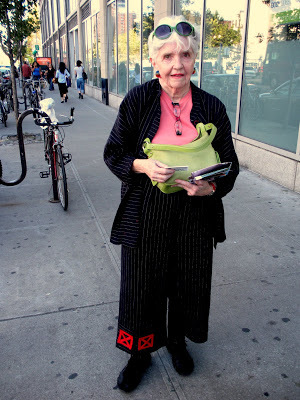 When I looked more closely, I noticed two red squares stitched onto the right cuff of her pants. She was in a hurry to catch the bus, so I never did find out about the mysterious red symbols, but they definitely add some unique design to her look. When we met Lucy, she was enjoying a conversation with friends on a park bench. When asked for her photo, she told us that it wasn’t a problem; she gets asked for her photo all the time. Her only request was that we send a hard copy. When I asked about her style inspirations, she said she just wears what she wants to wear, she’s not trying to follow any kind of fashion or style. Trying or not, she hits the mark.